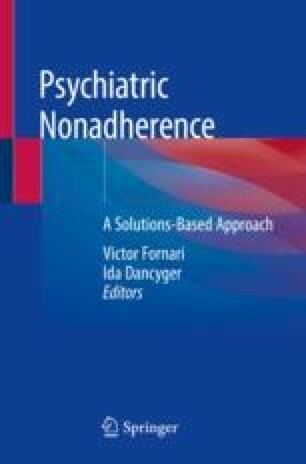 An estimated 75–90% of persons with schizophrenia become nonadherent to medications within two years of hospital discharge. Adherence challenges divide into five factors: social and economic factors (unmarried and male persons have less adherence), health-care team- and system-related factors (lower adherence rates correlate with less trust in physicians and lower expectations that physicians will be helpful), condition-related factors (less insight is associated with less adherence), therapy-related factors (complicated regimens reduce adherence), and patient-related factors (less education and less positive attitudes toward medication are associated with less adherence). Interventions exist to address each of these factors. Social and economic interventions address obstacles of poverty and access to health care. Health-care team and health system interventions (court-ordered treatment, assertive community treatment, and digital health technologies) enhance opportunities for engaging with treaters. Condition-related interventions (treating symptoms and comorbidities) aim to prevent symptoms from interfering with the treatment. Therapy-related interventions (medication selection) aim to optimize and individualize the treatment regimen. Patient-related interventions (psychotherapy, financial incentives) help to shape the patient’s beliefs and motivations. Helping patients to engage in therapy is not straightforward and requires a multifaceted approach. In the end the goal is not only to improve adherence but to improve outcomes. PhenX Toolkit Data Collection Worksheets. Brief Adherence Rating Scale (BARS). 2018. https://www.phenxtoolkit.org/toolkit_content/PDF/PX661801.pdf. Accessed 2/9/2018. World Health Organization. Adherence to long-term therapies: evidence for action. 2003. http://www.who.int/chp/knowledge/publications/adherence_report/en/. Accessed 2/5/2018. Food and Drug Administration. FDA approves pill with sensor that digitally tracks if patients have ingested their medication. 2017. https://www.fda.gov/NewsEvents/Newsroom/PressAnnouncements/ucm584933htm. Accessed 1/13/2018.